The Brown Bengal is by far the most popular and commonly bred of the recognized colors. This color has a large range of background colors such as golden, cream, tawny, honey, taupe, buff, tan, beige, or caramel. 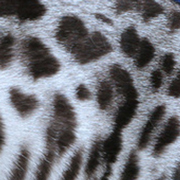 The Brown Bengal will have black or deep brown spotted or marble patterns. Their eye colors are green or golden. 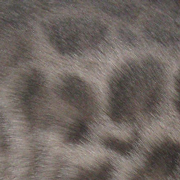 Silver Bengals have a very light silvery background with dark black spotted or marble pattern. Their eye color is green or golden. Snow Bengals refers to a group of colors with three distinctive genetic variations being the Seal Lynx Point, the Seal Mink, and the Seal Sepia. Snow Bengals are increasing in popularity and generally have a very soft and sweet personality. The Seal Lynx Point is the lightest of the snow group in color. Their pattern develops as they mature. 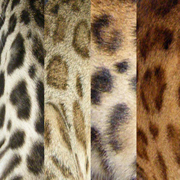 The SLP will have a warm gray or tan spotted or marble pattern on a white or cream background. They are the only Bengal color with the ice blue eye color. The Seal Mink will usually be born with a detectable pattern that will darken as they grow. 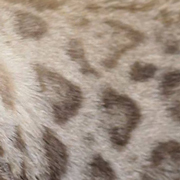 The background color is usually ivory, cream, or buff with an almost caramel-chocolate tone to their spotted or marbled pattern. Seal Minks have aqua or green eyes. Seal Sepias are usually the darkest of the snow group and are most often born with a distinctive pattern in seal brown to dark seal brown spotted or marble pattern. The Seal Sepia’s eye color is golden or green. 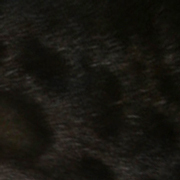 Melanistic Bengals have a black background with faint dark brown-black spotted pattern which can sometimes only be seen in natural sunlight. This color tends to have a buttery-peachy toned background color with bluish-gray spotted or marbled pattern. 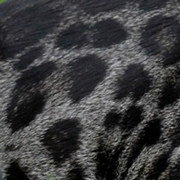 The Blue Bengal’s pattern and markings will never turn black.